The U.S. Food and Drug Administration (FDA) has expanded approval for a personalized cellular therapy developed at the University of Pennsylvania's Abramson Cancer Center, this time for the treatment of adult patients with relapsed or refractory large B-Cell lymphoma after two or more lines of systemic therapy. Today's approval includes treatment of diffuse large B-cell lymphoma (DLBCL) - the most common form of non-Hodgkin's lymphoma—as well as high grade B-cell lymphoma and DLBCL arising from follicular lymphoma. The approval was granted today to Novartis for the chimeric antigen receptor (CAR) T-cell therapy Kymriah (tisagenlecleucel, formerly CTL019), making it the second indication for the nation's first personalized cellular therapy for cancer. "This is an exciting event—seeing this lifesaving therapy become available widely to a large patient population with an unmet medical need," said Stephen J. Schuster, MD, the Robert and Margarita Louis-Dreyfus Professor in Chronic Lymphocytic Leukemia and Lymphoma Clinical Care and Research and director of the Lymphoma Program at Penn's Abramson Cancer Center. "Many lives may be saved." In August 2017, Kymriah became the first therapy based on gene transfer ever approved by the FDA, when it was authorized for children and young adults with relapsed or refractory B-cell precursor acute lymphoblastic leukemia (ALL). The FDA's action is the latest accomplishment in the alliance between Penn and Novartis, which entered into a global collaboration in 2012 to further research, develop, and commercialize Kymriah and other CAR T-cell therapies for the treatment of cancers. Investigators at Penn's Perelman School of Medicine, who led research, development, and clinical trials of CAR T therapy, in collaboration with Novartis, called today's approval a massive step with potentially life-saving implications for patients. "We're proud to have developed this therapy through all phases of development and clinical trials right here at Penn and in collaboration with Novartis," said Carl June, MD, the Richard W. Vague Professor in Immunotherapy in the department of Pathology and Laboratory Medicine in the Perelman School of Medicine and director of the Center for Cellular Immunotherapies in the Abramson Cancer Center. 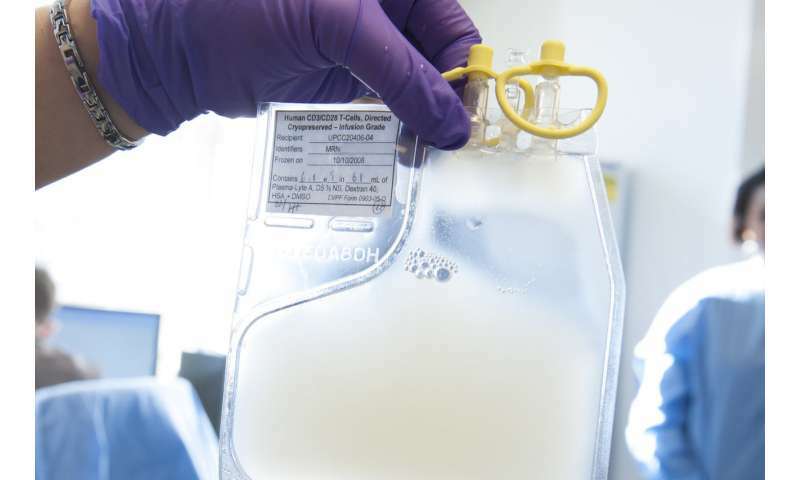 The treatment modifies patients' own immune T cells, which are collected and reprogrammed at the Novartis manufacturing facility to potentially seek and destroy the patients' lymphoma cells. Once they are infused back into patients' bodies, these newly built cells both multiply and attack, targeting cells that express a protein called CD19. Tests reveal the army of hunter cells can grow to more than 10,000 new cells for each single engineered cell patients receive—producing durable remission rates in refractory lymphoma -, and can survive in the body for years. "Our collaboration with Penn has delivered Kymriah, a transformational therapy and first CAR-T to be approved, initially for pediatric and young adult patients with ALL and today for adult patients with DLBCL," said Liz Barrett, CEO, Novartis Oncology. "We are grateful to Penn for their leadership and to the courageous patients who participated in the clinical trials that have advanced Kymriah to be one of the most exciting technologies ever developed to fight cancer." The Novartis-Penn Center for Advanced Cellular Therapeutics (CACT) opened in 2016 and hosted Vice President Joe Biden at the launch of his Cancer Moonshot initiative, cementing Penn's role as international innovator in the development and manufacturing of personalized cellular therapies. Both of Schuster's studies were supported by Novartis. The single-site trial was also supported by grants from the National Institutes of Health (1R01CA165206), as well as through philanthropic support for the Lymphoma Program at the Abramson Cancer Center of the University of Pennsylvania from James and Frances Maguire and the Frances Maguire Lymphoma Research Fund, Margarita Louis-Dreyfus, and Sharyn Berman and the Richard Berman Family Funds for CLL and Lymphomas. Note: The University of Pennsylvania has licensed some technologies involved in these studies to Novartis. Some of the scientists involved in these trials are inventors of these technologies. As a result of the licensing relationship with Novartis, the University of Pennsylvania receives significant financial benefit, and some of these inventors have benefitted financially and/or may benefit financially in the future.